As a 35 year old raised in Berkeley, California, I grew up a big A's, Warriors and 49ers fan. I first became attached to the Warriors listening to Greg Papa call the '91-'92 Warriors season on the radio, while shooting nerf baskets in my room emulating the play by play. And by attached, I mean severely emotionally invested :) After the Webber debacle, there was brief excitement with Sprewell until a few years later......well, we all know what happened after that. In 4th grade, I even had my dad give me the haircut of my favorite player, hall of famer, Chris Mullin. I drew a lot as a young child, off and on throughout elementary, middle and high school, with drawing subjects inspired by my environment, from palm trees, my dad surfing, TinTin comics, to the Berkeley public playground basketball courts my mom took to me to to hoist up shots as a 4 year old. My artistic subject matter evolved to sports around age 7 or 8, as I became hooked on the 49ers, Warriors, A’s, Cal Football, and my growing card collection. My sketches focused on players like Steve Young, Jerry Rice, Mark McGwire, Frank Thomas, Greg Maddux, or in high school, graphite drawings of the early 2000’s A’s teams. I always had the interest in making what I was putting on the paper look as real as possible, capturing the larger than life-like quality I experienced at games, TV and print media. Thus was the challenge, my eye always saw more than my hand could do. I became an art student at UC Santa Cruz, developing my graphite-centric work into oil paintings and pastels, a body of work of the Oakland A's, graduating with a BA in 2005. After a serendipitous 3 month temp job in the mailroom at the young company that was salesforce.com, I spent my 20's there working in the Facilities and Real Estate departments. I left at the end of 2013 in search of finding something that was me, returning to face fears of artistic inadequacy, perfectionism, and most importantly giving art a valid career attempt. After traveling in 2014, with my savings gone, the intuitive, sudden, creative spark for YaniMade came out of a personally dark period in early May, 2015 during the Warriors playoff run. While drawing "Curry In Your Kitchen," I had a vision of the drawing as a shirt. Several months later, after researching apparel printing methods and trial and error with different companies, in September 2015, the "Curry In Your Kitchen" tee prototype was made, released and the apparel brand born. Now, 3.5 years of arduous R&D later, the perfected product (print, art placement, pattern, fabric and finishing) is a series of 5 originals, making it's debut in the Executive Suite kiosks at Oracle Arena for Warriors 2018-2019 home games. This is joined by the debut of the limited edition Archival Giclee Fine Art prints and the 5 original drawings. YaniMade is art. It’s an innovative player themed apparel brand, drawing inspiration from the evolving sports landscape, merging fine art, design and fashion sensibilities, with top quality sublimation printing and premium fabric. It's a series of limited edition wearable prints of color pencil drawings by Yani Teichner. 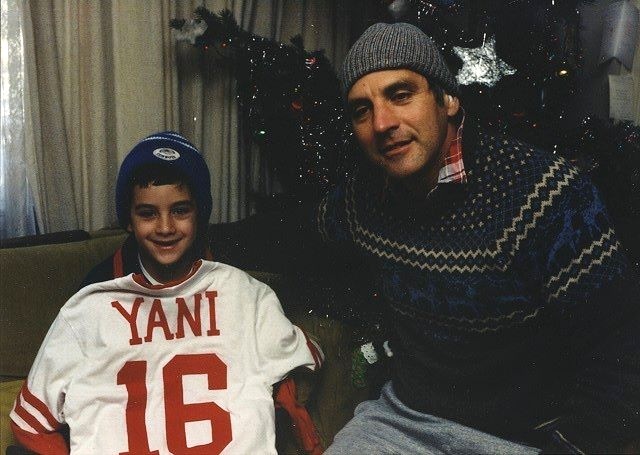 YaniMade brings attention to detail, aesthetics and beauty to fabric, in an era of mass produced team and fan gear. It documents and celebrates iconic pro athletes that have moved the needle in their respective fanbases, both in sport and popular culture. Made in the USA.